This dog carries two copies of the SD Allele which has been associated with higher shedding than sd/SD and sd/sd dogs. However, the overall degree of shedding for this dog is dependent on the combination of this dog's genotypes at the SD and IC loci. This dog will pass on SD to 100% of its offspring. This dog carries one copy of the sd allele and one copy of the SD allele which has been associated with moderate shedding compared to SD/SD and sd/sd dogs. However, the overall degree of shedding for this dog is dependent on the combination of this dog's genotypes at the SD and IC loci. This dog will pass on the SD allele to 50% of its offspring and the sd allele to 50% of its offspring. This dog carries two copies of the sd allele which has been associated with lower shedding than SD/SD and sd/SD dogs. However, the overall degree of shedding for this dog is dependent on the combination of this dog's genotypes at the SD and IC loci. This dog will pass on the sd allele to 100% of its offspring. Genetic testing of the MC5R gene will reliably determine whether or not a dog is a genetic Carrier of the variant that contributes to higher shedding in certain breeds of dog. Shedding caused by the SD Locus is inherited in an autosomal incomplete dominant fashion meaning that only one copy of the SD variant is required to produce increased shedding. Dogs with one copy of the SD variant (sd/SD) can have moderate shedding that is in the spectrum somewhere between dogs with high shedding (SD/SD) and low shedding (sd/sd). Breeding two dogs that are carriers of the high shedding SD variant (sd/SD) will result in about 25% of the puppies inheriting two copies of the SD variant (SD/SD), high shedding, about 50% of the puppies inheriting one copy of the SD variant (sd/SD), moderate shedding, and about 25% of the puppies inheriting two copies of the sd variant (sd/sd), low shedding. To provide a better understanding of the overall shedding status, a dog should also be tested for the IC (Improper Coat/Furnishings) locus because the IC variant has also been associated with higher shedding in dogs. 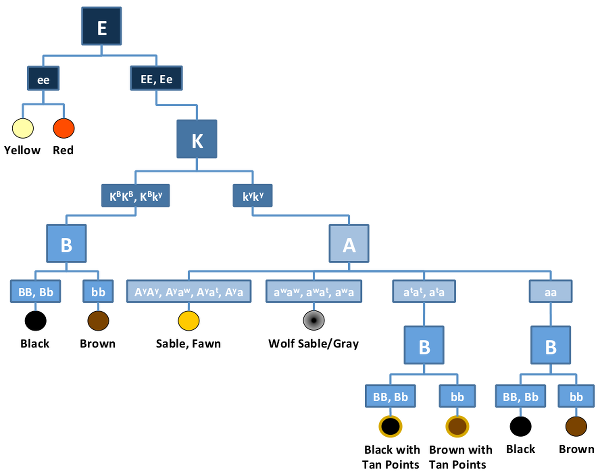 Dogs with an improper coat do not need to be tested for the IC locus because they all have an IC/IC genotype and will pass on one copy of IC (high shedding) to all of their offspring.